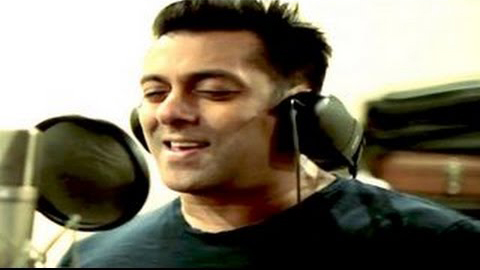 Salman Khan, who is known for his dashing looks and ability to play diverse roles with equal finesse, is all set to please his fans with his singing in “Hero”. The movie, which is a home production of this versatile actor, will have Salman signing the love song “Main Hoon Hero Tera”. The film which will mark the debut of Sooraj Pancholi, the son of Aditya Pancholi and Zarina Wahab and Athiya Shetty, is not the first film which in which Salman will be lending his voice to a song. Earlier Salman has sung songs in movies like Kick, Wanted and Hello Brother and has wooed the audiences with even this aspect of his personality. Salman released the teaser of his upcoming song on twitter earlier this month and as expected it created a buzz within no time at all. People flocked the internet to watch Salman sing this love song and the superstar surely did not disappoint them a he has really done justice to the song. What’s more, the clip proved to be a real treat for the female fans as Salman was looking ravishingly handsome in the video. While the release date for Hero is not yet known, it is believed that the movie may hit the theaters sometime next year. Incidentally, Salman releasing the trailer of his movie, even it is only a clipping of his song is thought to have been inspired by a similar marketing strategy followed by his friend and Collegue Shahrukh Khan!